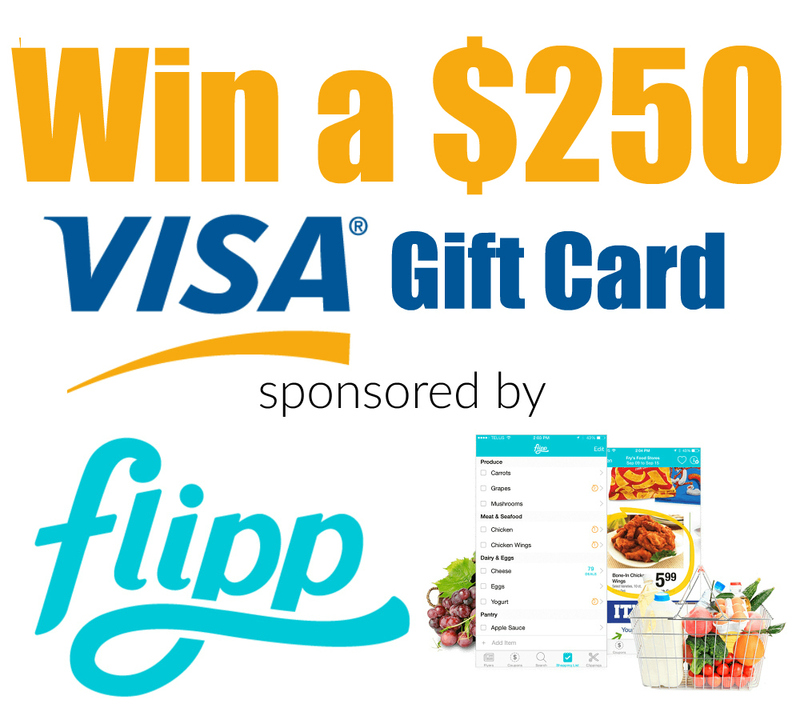 $250 Visa Card Giveaway from Flipp! Are you currently pregnant or have a baby at home? Today at Thrifty Nifty Mommy, Janessa is sharing tips on how to find the BEST baby deals and save the most money during baby’s first few years! There is so much to think about when new baby arrives. Money is the last thing you should have to worry about. How have you found ways to save money on all of your baby’s needs? I’ve teamed up with Janessa, a few other bloggers, and the amazing (FREE) shopping app Flipp to bring you a $250 Visa gift card giveaway, to help you stock up on all of baby’s essentials! What’s Flipp? Flipp is the essential app for your weekly shopping. With Flipp you can search circular deals and coupons by item, brand, or category to quickly find the best deals on your weekly essentials and make saving money super easy. Flipp is the only app that matches local circular deals with coupons from the brands you love to bring you the most savings. Simply add loyalty cards from your favorite stores on to Flipp and then clip coupon deals to your card for instant savings at checkout. To keep you on track of your weekly shopping, Flipp’s ultimate shopping list will help you plan ahead by finding what’s on sale and stay organized in-store. Flipp brings you the latest weekly ads from your favorite stores including Walmart, Target, Family Dollar, Walgreens, Kroger, and over 800 more retailers. By using Flipp, you can save 20-50% on the items you need every week. With Flipp, you can also save money on your favorite brands with coupons from Tide, Gain, Dawn, Crest, Charmin, Bounty, Olay, Pampers, and hundreds more. WIN the $250 Visa gift card, sponsored by Flipp!